For the same-titled works, see Buried treasure (disambiguation). "Treasure chest" redirects here. 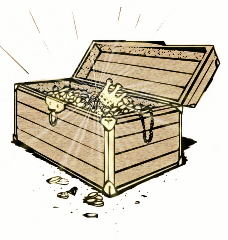 For other uses, see Treasure chest (disambiguation). A buried treasure is an important part of the popular beliefs surrounding pirates and Old West outlaws. According to popular conception, criminals and others often buried their stolen fortunes in remote places, intending to return for them later, often with the use of treasure maps. In reality, pirates burying treasure was rare: the only pirate known to have buried treasure was William Kidd, who is believed to have buried at least some of his wealth on Long Island before sailing into New York City. Kidd had originally been commissioned as a privateer for England, but his behavior had strayed into outright piracy, and he hoped that his treasure could serve as a bargaining chip in negotiations to avoid punishment. His bid was unsuccessful, however, and Kidd was hanged as a pirate. In English fiction there are three well-known stories that helped to popularize the myth of buried pirate treasure: "Wolfert Webber" (1824) by Washington Irving, "The Gold-Bug" (1843) by Edgar Allan Poe and Treasure Island (1883) by Robert Louis Stevenson. They differ widely in plot and literary treatment but are blood kin from the common ancestor of the William Kidd legend. David Cordingly states that "The effect of Treasure Island on our perception of pirates cannot be overestimated," and says of the idea of treasure maps leading to buried treasure that, "[I]t is an entirely fictional device." Stevenson's Treasure Island was directly influenced by Irving's "Wolfert Webber", Stevenson saying in his preface "It is my debt to Washington Irving that exercises my conscience, and justly so, for I believe plagiarism was rarely carried farther... the whole inner spirit and a good deal of the material detail of my first chapters... were the property of Washington Irving." In 1911, American author Ralph D. Paine conducted a survey of all known or purported stories of buried treasure and published them in The Book of Buried Treasure. He found a common trait in all the stories: there was always a lone survivor of a piratical crew who somehow preserved a chart showing where the treasure was buried, but unable to return himself, he transfers the map or information to a friend or shipmate, usually on his deathbed. This person would then go search in vain for the treasure, but not before transferring the legend down to another hapless seeker. There are a number of reports of supposed buried pirate treasure that surfaced much earlier than these works, which indicates that at least the idea was around for more than a century before those stories were published. For example, some underground passages and structures on Oak Island (in Nova Scotia) have been excavated extensively since 1795 in the belief that one or more pirate captains had stashed large amounts of loot there. These excavations were said to have been prompted by still older legends of buried pirate treasure in the area. No treasure has ever been found. The Treasure of Lima is a supposed buried treasure on Cocos Island in the Pacific left there by pirates. The treasure, estimated to be worth £160 million, was stolen by British Captain William Thompson in 1820 after he was entrusted to transport it from Peru to Mexico. The only authenticated treasure chest in the United States, once owned by Thomas Tew, is kept at the Pirate Soul Museum in St Augustine, Florida. Buried treasure is not the same as a hoard, of which there have been thousands of examples found by archaeologists and metal detectors. Buried treasure is as much a cultural concept as an objective thing. It is related to pirates and other criminals who leave stolen artifacts behind for later retrieval, typically in remote places like islands, sometimes with maps leading back to the treasure. Hoard, a collection of valuable objects or artifacts, sometimes purposely buried in the ground. 1 2 Cordingly, David (1995). Under the Black Flag: The Romance and Reality of Life Among the Pirates. ISBN 0-679-42560-8. 1 2 Jasper Copping (5 August 2012). "British expedition to Pacific 'treasure island' where pirates buried their plunder". The Telegraph. Retrieved August 12, 2012. ↑ Abravanel, Lesley; Miller, Laura Lea; Miller, Laura. Frommer's Florida 2011. p. 302.